Whole chickens require much less packaging – just one plastic bag or butcher wrap compared to parts that get packaged into multiple Styrofoam trays. In the kitchen whole chickens result in less food waste since all parts are used. Whole chickens really stretch the budget, being much cheaper pound for pound. Compare $.99 – $1.59 per pound for whole chickens to prepackaged parts that range anywhere from $1.99 to $6.99 per pound or more. A whole chicken yields many meals and a vast variety of meal options. A whole fryer, cut up results in: 6-8 breast cutlets (Chicken Divan, Chicken Parmesan, Chicken Cutlets, Tandoori Chicken, etc. ); two thighs and 2 legs (Coconut Chicken, Chicken Tortilla Soup, chicken pot pie, etc. ); two drumettes (these are frozen and collected from more chickens to make appetizers, etc. ); 2 wings tips and a carcass, used to make Traditional Bone Stock (makes wonderful soups, sauces, curries, brown rice, etc. ); chicken fat which is a traditional healthy fat (called “schmaltz” by old timers) that can be used for sauteing or in sauces imparting a smooth, toothsome quality to food; organ meats which can be eaten for dense nutrition (if the family objects, these parts can be used for healthy pet food). Whole chickens are much less likely to contain pathogens that cause food-borne illness since they are less processed than parts sold separately. Eating the whole chicken is more nutritious than eating boneless, skinless breasts or thighs. Because I buy local sustainably raised chickens, it is safe to eat the skin, the fat, and use the bones for stock. All of these “throw-away” parts have wonderful culinary and nutritional value. All in all, I spend between from $5 (sale price) – $7.95 (regular price) and get from 4-7 meals out of one chicken (depending on leftovers). I also get sauces that would cost big bucks, brimming with dense nutrition and superb flavor but devoid of the harmful fake ingredients found in store-bought varieties. And money is saved on oils since I use the schmaltz in place of olive oil, butter etc. That’s pretty cheap eating! But with entrees such as Chicken Divan, Chicken Parmesan, chicken curries, stir-fry, delicious soups, even main dish salads, the meals have great appeal. From a class in my home on how to cut up a whole chicken. It makes sense (cents) to buy chickens whole! 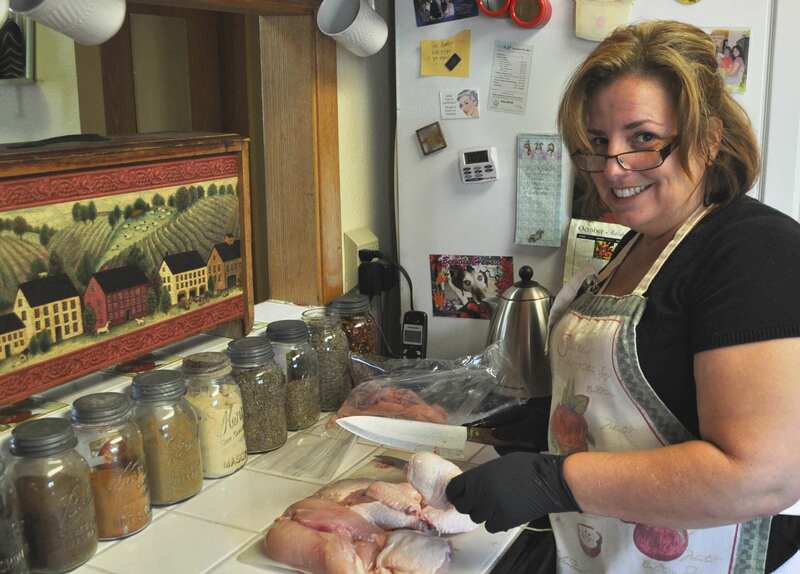 Many women opt not to because they do not know the best procedures to get the most out of a whole bird (such as how to cut up a whole chicken). So I found some really great demos on YouTube about how to use a whole chicken. A friend cutting up a whole chicken for the first time. First-rate job, Kerry! 1. Do not trim off the fat. It goes into the pot as well, along with the bones and any skin removed from the breast or other parts. After the stock has chilled I remove the fat from on top of the stock and use it for sautéing, etc. since it is a nutritious fat. Keep it covered in the refrigerator. 2. To make stock, put only the carcass and water (enough to cover by 2 inches) in the stockpot. I also include about 4 chicken feet, which add gelatin to the stock. (I buy chicken feet frozen at Whole Foods Market.) Next, add 2 tablespoons of raw unpasteurized apple cider vinegar to the pot so it can begin to draw minerals out of the bones. Let the pot sit with the lid on for an hour at room temperature. 3. Turn on the burner and bring to a boil. Reduce to a simmer and remove any scum as it forms. Add veggies and herbs. Sometimes, I leave out the veggies because I really like the taste of “naked” stock. 5. Continue to cook the stock longer than suggested – a total of about 6 hours. Stock will not gel if cooked much longer. Still, six hours is enough time to transfer the minerals, glucosamine, collagen, gelatin, etc. from the carcass to the stock. 6. Did you notice that chilled stock in the video was watery? Really good chicken stock gels – like jello – after chilling as a result of cooking it longer than an hour. Adding chicken feet aids in this also. Why not get together with a friend who wants to learn how to cut up a whole chicken. Watch the video and then give it a try! This post has really good timing~ I’m making a whole chicken today. I do one at least once a month so I can replenish our chicken broth supply. I use my crock pot to make the broth and it turns out fabulous every time. Thanks for the tips! .-= Amy Lynne´s last blog ..Look What Happened! =-. Thanks for the how-to on cutting up a whole chicken, I’ve always wondered how to do that! And WHERE can you get free-range, local chickens so cheaply? I pay at least $14-$15 per chicken here in southern Ohio. We would eat a lot more chicken at our house if I had such an inexpensive source for quality chickens. WOW that is an amazing price for those chickens. I pay a lot more than that! I know that is US prices but still, comparing I pay a lot more. I just cooked a whole chicken on Monday. Interesting to see the “right” way to cut it…I just sort of hack away it it LOL. I am making my stock today…yesterday was a bad day and didn’t get it done. I buy my chickens whole from a famer I trust and they taste great! We use ALL of the parts. We blend the marrow and soft parts (skin & fat & and soft tendons) into a pate that the kids either eat plain (cuz they love it) or put into bowls of soup. I do have to disagree, however, with how far a whole chicken can go. We have 4 young kids and I spend $11 on one chicken, only to be able to pull 2 pounds of meat off of it. 2 pounds of meat in MY family is only one meal and there is NEVER enough leftover for even a light lunch for us all. We do however, get stock and pate from it but I’ve been pretty dissapointed lately that I can’t get leftovers from all that pickin’! Sigh…. Glad my roaster holds 2 chickens! .-= mom24´s last blog ..Hazards of Good Food! =-. I thought this might come up. The reason I get so many meals from one chicken is because my children have all flown the coop (pardon the pun) and it is just my husband and me at home. Also, I buy large chickens – 5 pounds or more. I should have mentioned that in the post. But it seems that most of the commenters do not have access to such low prices. I live in the Bay Area in California and get my chickens at The Nugget. The regular price is $1.59 per pound and sale prices of $.99 per pound are often in effect. These chickens are not organic but they are free-range birds that are locally and sustainably raised. But I am most interested in how you make the marrow pate. Do you have that posted on your blog? I, too, buy whole chickens, but don’t have access to those prices on free-range chickens! Your prices are great! The cheapest in my neck of the woods is $4/lb. And with three “kids” ages 21, 18, and 12, plus a husband almost 6 1/2 feet tall, I do well by getting two meals (and lots of stock) out of a chicken. .-= Paula´s last blog ..Tuesday Tastiness #19 – Easy Fruit-Sweetened Berry Crisp =-. Great post!! I am going to give it a try! Now I just need to figure out where I can buy my whole chickens! .-= Angela Beery´s last blog ..Sidewalk Sermon =-. Wow! I agree those are great prices that are not available where I live, that I know of. But maybe I need to really look and see what I can find. Now I want to cook a chicken! .-= Angela´s last blog ..Using a Nose Bidet =-. Agreed–I was hoping to find some hint in the comments about how to get such a great price! I’d even be happy with $4/lb.–the cheapest I can find here is $7/lb., and that’s direct from the farmer. I would REALLY like to find some cheaper chicken because we might have to stop eating it entirely. (I have ethical problems with the way battery chickens are raised and won’t buy the cheap stuff at the store.) If anyone has any tips or advice for me, I’d really appreciate it! Great post, thanks for all the info. I just recently started buying whole chickens, but now I realize I’m not utilizing all of the parts as best as I can. I will take this advice next time and use more of the chicken. i need to get the guts up to do this. it is so much healthier and economical but i just hate raw meat. it grosses me out. i will get there! .-= kami´s last blog ..i can’t believe it!! =-. I’ve been looking for a way to sanitize something sans-clorox! Thanks! And I use whole chickens occasionally, but when you work 40 hours a week and walk your dog an hour a day and commute to work and have a husband, there’s not much time at home for preparing all that. And I get a bit squeamish with the breaking bones sound. Hopefully once I’m a mom full time I’ll be able to work this into the schedule! For now its still Trader Joe’s hormone-free frozen breasts! .-= Kait Palmer´s last blog ..Drinking Wine From a Dixie Cup =-. I don’t even begin to imagine that your prices would be in the realm of what I expect to pay. Aussie food prices are always higher than US prices. It’s the one thing that I would relish if I had to move. When I have a whole chook, I get one roast meal and enough meat for sandwiches for the kid’s lunches for about 2-3 days tops. If I had a really big chicken ~ about a 2kg one, then I might get enough for a pie or casserole for the 2nd meal. Then I use the bones for stock, which I do in the CP too. I prefer my stock made with bones that have been roasted. I’ve found it to be ‘cleaner’….less scum and it tastes better. My kids aren’t tiny anymore. They’re at that stage where they eat as much as we do and their appetites grow. For us to use pieces as that video wonderfully demonstrated, we might get one meal and 1-2 lunch sized leftover portion. But it would be the far more expensive way to go. About $7 for the meal, as opposed to $4? Unfortunately things just become a matter of numbers and fitting into your budget. .-= Tracy´s last blog ..Easter Traditions =-. I am with most of you ladies, paying significantly more for my chickens. I pay either $3 or $4 per lb, from the two sources of whole chickens that I use (one is local, the other is Shelton Poultry). So a whole chicken for me is usually between $9-18, depending on the size and where I got it. I think it’s worth noting that Sharon’s kids have grown up, and I believe she is just cooking for herself and her husband. So she really is accurate in saying how many meals she stretches out of one chicken! Obviously, that doesn’t translate into nearly as many meals when many of us younger mamas are feeding a lot of mouths, of kids who eat as much or almost as much as we do! 🙂 We’re all in different seasons, aren’t we? For us, if we choose to eat the chicken as our main entree on the first night, we will only get 1-2 other meals out of the chicken (and they will not have large amounts of chicken- more like chicken in a very veggie-full soup, or some chicken in an egg salad or in a tortilla wrap filling), as well as the broth I make, of cousre. Love the videos you shared, Sharon! I am eager to try my hand at actually cutting up a raw chicken and using the parts individually, rather than always just cooking the whole thing and then chopping it up. It would be nice to chop up several chickens and serve a dinner of chicken legs, or to freeze a bunch of breasts. Thanks for the great post! This sounds like the way we do it at our house also! This is a very helpful post! But yes, how do you find such inexpensive chickens. I have no problem playing double for mine though. I just love making bone broth from them…yum! 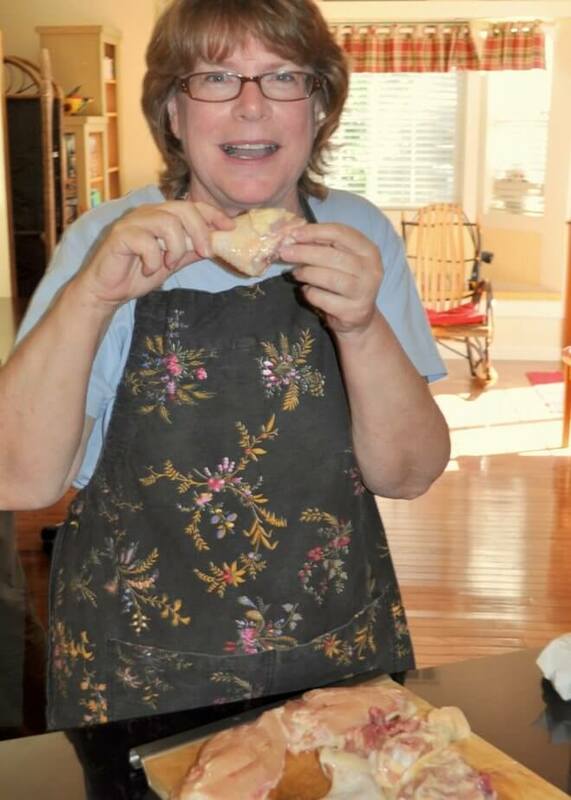 .-= Stacy´s last blog ..Almond Shortbread Cookies =-. I love using whole chickens! I get so many meals, plus stock from one chicken–it’s amazing! I fed 11 people one night, and then 9 people two more nights just from one whole chicken. I am going to watch the video on cutting up a whole chicken so I can get the different cuts. Usually what I do with mine is roast it for the first meal, and then I use the carcass to make the stock and pull the flesh from the bones for the other meals. The flesh pulls off easily this way, but it would be nice to be able to take the raw chicken and get the cuts I want from it. That would save me from buying the precut breasts and whatnot. Excellent post! Thanks for passing along this helpful information! .-= Amy @ Homestead Revival´s last blog ..The Backyard Homestead =-. Im new to this blog but am already enjoying it! 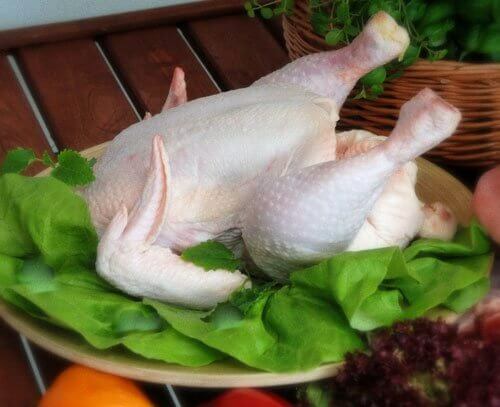 Whole Foods Market has sales on their whole chickens…this Friday they are 1.69 lb! Also, for great prices on whole chickens check out http://www.quailcovefarms.com. If you get a case (8) the price is 1.69 lb, they too have great chicken sales! Thanks for all of the interesting info! I’ve been using this method of buying a whole chicken on sale and turning it into a couple of meals for a while now. I’m only cooking for two so I’m able to get more out of an individual chicken than someone cooking for a large family. Generally I get my chickens for $6-$7 without finding a sale. The last chicken I got was on sale and cost me about $5.75 or so and this was at Winn Dixie, a chain grocery store. The first meal is always chicken that I roast in the oven and we cut it into two breast fillets with roasted veggies on the side. I then peel off any extra meat I can manage and either freeze it to use in casseroles, chilis, tacos and etc.. I also roast the bones, break them up and then boil them with some veggies and herbs. The marrow in the bones is especially nutritious and gives the stock/soup more flavor and body. All in all we get 3-6 meals depending on how big the chicken is and what we’re feeling like eating. If I can get 6 meals out of this latest bird then that’s about .95 for meat/per meal. Pretty good savings to me! I have never left a comment on blog before but I really like this blog…so much useful info, I was able to get whole chickens for 50 cents a pound so I bought as many as the limit would allow. Then I sent my husband in and started going to the other stores around town. I have alot of chicken but could not pass on the price. Thanks again for the useful info. I’m wondering what size of bird to purchase to be the most economical. The bones are about the same size in all weights of birds, so one would think buying a bigger bird would be better. On the other hand, I don’t relish pulling out large globs of chicken fat on the heavier end of whole birds–that’s a waste of money, too. Any opinions?